This product is genius. It makes vape cartridges even more convenient and easy to use. Since I first experienced quality vape pen cartridges I’ve become convinced they are the future of cannabis, both as a consumer product for adults and as a medicine. They are neat, clean, convenient and if you choose a reputable brand they are the safest, most effective method of consuming cannabis. The most important factors are that they are made by a safe extraction process which nowadays usually means CO2 extraction and that the oil is ‘winterised’. This means it goes through a secondary process to remove plant waxes, lipids, fats and chlorophyll. The purified product is then safe for vaping. Of course, in the UK it’s not easy to get hold of any vape cartridges. There are some good CBD products available and for anyone using these I highly recommend they invest in a SteamCloud Mini from NY Vape Shop. I had to turn to the delights available in California to give the SteamCloud the sort of test it deserves. I sampled a few cartridges from Absolute Xtracts. All I can say is it is an absolute tragedy that these lovely little containers of bliss are not obtainable in the UK, in fact nowhere outside California. If you get to take a trip to one of the enlighted US states where such products are available, you can certainly find similar cartridges and in my opinion, the SteamCloud Mini is the best way to use them. It charges up quickly using the usual USB cable. You have to screw on a small magnetic cap to the cartridge first (two are provided in the box) and then this lovely little device just seems to nestle perfectly in the hand, much nicer than the long and rather flimsy vape ‘pens’ which most people are using. It’s also an extremely powerful battery giving big clouds of vapour and lasting a long time. 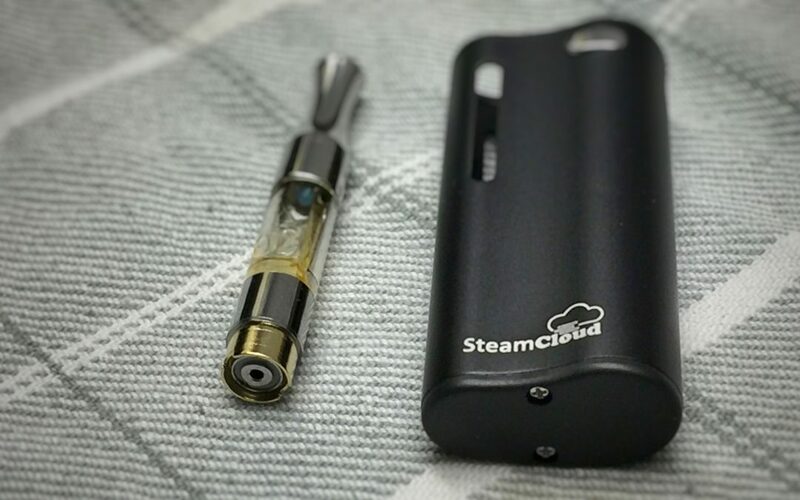 So I give the SteamCloud Mini ten out of ten. I’d say for the modern cannabis consumer it’s as essential as your pack of kingsize papers used to be.